Many times during the fall season as I browse through my cookbooks for pumpkin ideas I often come across a new soup that catches my attention for some one reason or another. This recipe roasted pumpkin or butternut soup caught my attention because of the techniques used in the preparation of the vegetables. I love to roast my vegetables, which brings on several new flavors from a smokey taste to almost a nutty flavor. This recipe delivers the intense taste of the vegetables I expected. Make this for your Thanksgiving dinner and serve it as an appetizer in small shot glasses, or as a first course. Don’t forget to add the pecans, they add a great crunch to the soup. 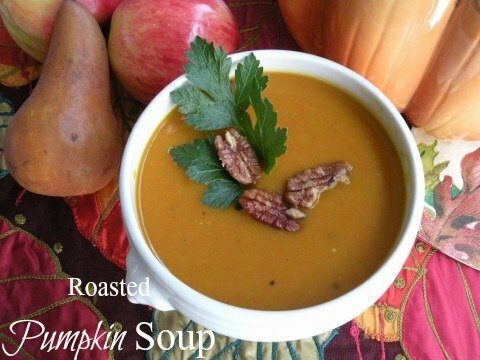 Serve this soup as a first course or alone for a Fall treat for your family and friends. Line the roasting pan with foil. Place carrots, onion, and garlic in prepared pan. Drizzle with olive oil and toss until well coated. Sprinkle with salt and pepper. Add pumpkin quarters to pan. Spread one tablespoon of brown sugar on each pumpkin quarter, top with 2 sage leaves. Drizzle with olive oil. Roast the vegetables for 45 minutes or until pumpkin is soft. Meanwhile, in a 4 quart Dutch oven bring broth to boiling; remove from heat. In batches, add vegetables and pumpkin to blender or food processor; blend until smooth, adding enough cooled broth to reach desired consistence. In a small bowl combine 2 tablespoons melted unsalted butter, ¼ teaspoon kosher salt, ⅛ teaspoon cayenne pepper. Add ½ cup pecans and toss. Spread onto a baking sheet lined with foil. Bake pecans for 5 minutes or until toasted. Cool completely. To serve: divide soup evenly among six bowls. Top with Spiced Pecans and Italian parsley. Making the soup :Prep all of your ingredients and place on tray. Place the vegetables on a sheet tray and sprinkle with salt, pepper,brown sugar, and sage. Roast in the oven until soft. Remove the pumpkin skin and place the roasted vegetable in the food processor or blender with partial broth and blend until smooth. Continue until all the broth and vegetables are blended. Serve with parsley and pecans on top.